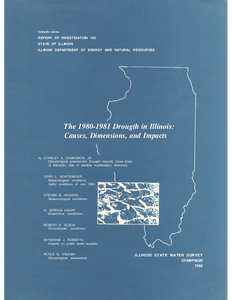 Description: This report addresses the 1980-1981 drought in Illinois. This 15-month drought, which began in February 1980 and was centered in the southern portions of the state, was not one of the extreme droughts of record. However, its importance derives from the fact that it is the most severe drought since those of the early 1950s. As such, the 1980-1981 drought potentially reflects a new set (or new types) of impacts on the states water resources due to many technological, hydrological, and institutional changes since the 1950s.As noted above, droughts are a basic and important feature of the climate and water resources of Illinois. The interesting near absence of droughts in the state between 1955 and 1976 makes the drought of 1980-1981 of great interest, although it was not extremely severe. Description: The 1988-1989 drought was one of the most disastrous droughts in the history of the state. 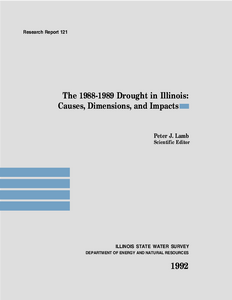 Hydrologic, meteorological, and climatological aspects of the 1988-1989 drought in Illinois are addressed. The drought is evaluated in terms of recipitation, streamflow, lakes and reservoirs, and ground-water resources of the state. The meteorological conditions that produced the drought also are addressed. Impacts and problems resulting from the drought are discussed along with various actions taken to ameliorate the problems. Although the primary goal of the study was to quantify the drought, primarily in a physical sense, an important secondary goal was to assess the impacts and the actions employed in order to derive information needed in future planning and handling of Illinois droughts. The report thus ends with a set of recommendations for coping with future droughts. 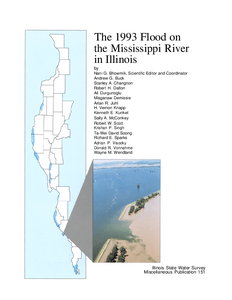 Description: This report on the 1993 flood on the Mississippi River in Illinois and on the lower reaches of the Illinois River was prepared by the Illinois State Water Survey with assistance from the Illinois Department of Transportation/Division of Water Resources and the Illinois Natural History Survey. The report begins with a brief description of the physical setting of the Upper Mississippi River System, including historical facts on climate, precipitation, hydrology, and floods. The 1993 flood is discussed with regard to precipitation, soil moisture, stages, flows, levee breaches, and discharge through levee breaches. Also discussed are impacts of the flood on social, economic, hydraulic and hydrologic, and environmental aspects of the river and its residents. Impacts on water quality, the environment, and public water supplies, including the beneficial and detrimental aspects of the flood, also are included. The lessons learned from this flood focus on the performance of the levees, governmental responses, the effects of flood fighting, change in stages due to levee breaches, flood modeling, and the lack of information dissemination to the public on the technical aspects of the flood. These lessons point out information gaps and the need for research in the areas of hydraulics and hydrology, meteorology, sediment transport and sedimentation, surface and groundwater interactions, water quality, and levees. 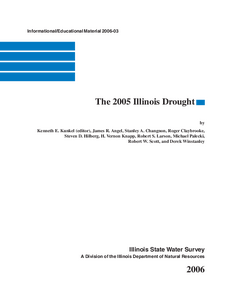 The report presents a comprehensive summary of the 1993 flood as far as climate, hydrology, and hydraulics are concerned. Description: Dry conditions in 2005 reached a historic level of severity in some parts of Illinois and ranked as one of the three most severe droughts in Illinois in 112 years of record. The timing of the dryness during the spring and summer, when water demand and use are high, ensured substantial impacts on agriculture and other sectors. The drought also had several unusual characteristics. The drought area was long and narrow, extending from south Texas to the Great Lakes, but within the Midwest, the drought had relatively minor impacts on states other than Illinois. A record number of remnants of hurricanes and tropical storms passed through Illinois during July, August, and September, substantially ameliorating drought conditions in portions of central and southern Illinois. Crop yields were surprisingly high in parts of the state, perhaps providing evidence of increased drought resistance in modern varieties and the benefits of timely rains. Description: The 2008 nominations process will certainly go down in history as one of the longest, most contentious, and most expensive in the nations history. It was also one of the most interesting and exciting ever. The race had more officially declared candidates, had more money spent on it, and for the Democrats was more closely contested than any race in recent history. Description: The Illinois Department of Agriculture, Sustainable Agriculture Program is pleased to announce the 2011 R.J. Vollmer Sustainable Agriculture Farmer of the Year. This years recipient is Jack Erisman from Pana, Illinois in Christian County. 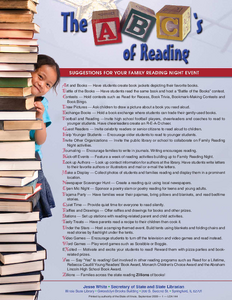 Description: Alphabatical list of ideas for Family Reading Night. Description: The Adam Walsh Child Protection and Safety Act of 2006 (PL 109-248) is a federal act which was signed into law on July 27, 2006. 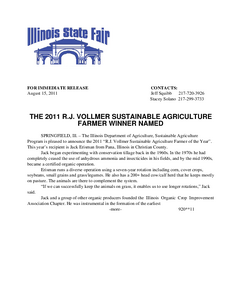 Description: Press Release: The American Red Cross, Illinois Department of Children and Family Services (DCFS) and Illinois Association of Park Districts will team up for a 10 a.m. press conference on Wednesday, July 2 at Lincoln Park, 5th Street and Sangamon Avenue, to remind the public about the importance of water safety for children and adults. Every year, there are between 80 and 90 drowning deaths reported in Illinois, and the sad fact is that most, if not all, drownings are preventable. 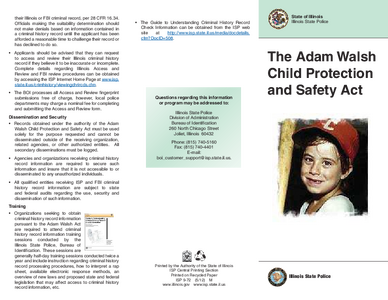 Description: Press Release: The American Red Cross, Illinois Department of Children and Family Services (DCFS), Illinois Department of Natural Resources and the Illinois Association of Park Districts will team up. Description: On November 4, 2008 the junior Senator from Illinois, Barack Obama, was elected the 44th President of the United States. Obama was the first president to be elected from Illinois since the Civil War era. 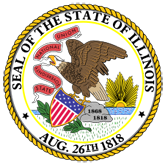 Description: Illinois Lieutenant Governor's Office guide explaining the economic, environmental, and community benefits of natural landscaping. 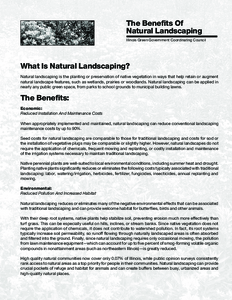 Natural landscaping is the planting or preservation of native vegetation in ways that help retain or augmentnatural landscape features, such as wetlands, prairies or woodlands. Natural landscaping can be applied in nearly any public green space, from parks to school grounds to municipal building lawns. 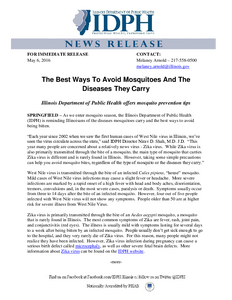 Description: Press release: As we enter mosquito season, the Illinois Department of Public Health(IDPH) is reminding Illinoisans of the diseases mosquitoes carry and the best ways to avoid being bitten. 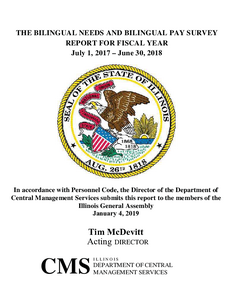 Description: The State of Illinois is committed to ensuring that all Illinois residents can fully participate in civic life and enjoy unrestricted access to the rights, privileges, and benefits to which they are entitled. Our State provides services that are often vital for health, welfare, safety, and quality of life. Description: Third Division No. 1-08-0139, The Board of Education Of Bremen High School District No. 228, Plaintiff-Appellant, v. Richard C. Mitchell, Defendant-Appellee. (The Board of Review of the Department of Employment Security; J. Hunt Bonan, as Chairman of the Board of Review; William J. Nolan and Stanley L. Drassler, Jr., as Members of the Board of Review; The Department of Employment Security; and James P. Sledge, as Director of the Department of Employment Security, Defendants.) Appeal from the Circuit Court of Cook County. Case No. 07 L 50725 Honorable Rita M. Novak, Judge Presiding. Description: Second Division, May 6, 2008 No. 1-06-3589 THE BOARD OF EDUCATION OF PARK FOREST- CHICAGO HEIGHTS SCHOOL DISTRICT NO. 163, COOK COUNTY, ILLINOIS, a Body Politic; and VIRGINIA FORD, a Current Individual Taxpayer and Cook County, Illinois Resident, Plaintiffs-Appellants, v. JAMES M. HOULIHAN, COOK COUNTY ASSESSOR, and THE COOK COUNTY BOARD OF REVIEW, and THORNCREEK APARTMENTS II AND III, L.L.C., Michigan Limited Liability Companies, et al., Defendants-Appellees. Appeal from the Circuit Court of Cook County. Honorable Martin S. Agran, Judge Presiding. Description: The Board of Education of the City of Chicago v. Cady THIRD DIVISION December 13, 2006 No. 1-05-1741 THE BOARD OF EDUCATION OF THE CITY OF CHICAGO, Petitioner, v. DAVID CADY, NORTHEASTERN ILLINOIS UNIVERSITY, and THE ILLINOIS HUMAN RIGHTS COMMISSION, Respondents. Petition for Review of an Order of the Illinois Human Rights Commission.